Incredibles 2 picks up right where the first movie left off and the attack of the Underminer. Springing into action, the Parr family works to stop him but is unable to apprehend him or keep him from robbing the bank. This puts superheroes in a bad light, again, and causes the government to finally shut down it’s superhero assistance program (who help relocate superheroes after incidents). Rick Dicker, who’s been helping the Parrs for years, tells them, “Politicians don’t understand people who do good things. That makes them nervous.”. It’s a sad state of affairs when the world has become so cynical and distrusting that people who do good, because it’s the right thing to do, even when no one asked them too, are discouraged or even outlawed from doing so. The film shines a mirror on the kind of world we’ve created today and it’s not pretty. The superheroes have an advocate in Winston Deavor who’s father was a massive supporter of superheroes in the past when they were legal. He has an interesting quote as he’s trying to recruit Frozone, Elastigirl and Mr. Incredible, he says, “It’s time to make some wrong things right. Help me bring supers back into the sunlight. We need to change people’s perceptions about superheroes…”. Now it’s said your perception determines your reality and there is some truth to that. Yet, the idea here, that the perception of superheroes needs to change in people’s minds is another frustrating mirroring of our society. It’s not important that superheroes have a right to exist or that doing what is right, is important, regardless of public opinion. What is actually “important”, is just getting people to perceive that superheroes are legitimate. Truth and right are not a factor, it’s really only the shifting sands of opinion that make something “right”. It’s a scary foundation. Late in the movie the villain says to Elastigirl, if you didn’t have these morals and values we could have been friends. Elastigirl and these heroes stand on the side of right and truth, even when it’s not popular because they know it’s the right thing to do and that is a wonderful message. The Incredibles continues to be the best version of the Fantastic Four we have seen on screen. The movie nicely gives each of the characters good storylines. Frozone is less a sidekick and more of a full member of the family now. Elastigirl is front and center as the one working in public to reverse public opinion on superheroes, leaving Mr. Incredible to be Mr. Mom at home. This is a very strong part of the film as Mr. Incredible, who has only really found joy in his superhero work, finds the joy that parenting can be. It’s beautiful to see a movie celebrate the importance of family and show how impactful it is to have father who is actively apart of his children’s lives. The movie, may not completely stand up to fourteen years of anticipation, but it’s one of this year’s best superhero movies and an absolute blast for the whole family! Incredibles 2 is rated 4 out of 5 superpowers. This entry was posted in Disney, Film, Incredibles, Movie Review, Movies, pixar, Uncategorized and tagged Disney, Film, Incredibles, Incredibles 2, Movie Review, Movies, Pixar on June 18, 2018 by mrushing02. The Marvel Cinematic Universe has given us many types of heroes. There are men in super suits, a boy bitten by a radioactive spider, a man irradiated by gamma rays, a being brought to life by an infinity stone, a norse god, a former Soviet super spy and a guy that’s really good with a bow, plus a girl that’s been made, in-human. Yet in all of this there has been something missing, something that’s a little esoteric and outside reality and this year Marvel fills that void with it’s newest hero, Doctor Strange. Doctor Stephen Strange is the quintessential man of the 21st century. He’s a materialist that believes there is nothing outside his five senses that he or science cannot explain. He’s arrogant and a complete narcissist, incapable of having anything in his life be more important than himself and to top it off he takes no accountability for the actions that lead him to loosing everything; because paying attention to your phone on a windy road while it’s raining is someone else’s fault. The beauty of the film is how he will be confronted by his beliefs and way of life and find it lacking. One of the most important moments in the film is an interaction with Strange and The Ancient One. Strange has begun to excel in his magical studies but his arrogance as a doctor transfers itself to arrogance as a sorcerer until he is challenged to think differently. It’s an incredible scene that speaks to the biblical idea seen from the beginning of time, that it’s not about us it’s about something much bigger. Watching Strange learn his lesson as he confronts Dormammu, who he has lock in an eternal time loop to save earth, is perfect. Strange is willing to spend beyond eternity, dying over and over again, if that’s what it takes to ensure the safety of the planet. “Greater love has no one than this, that someone lay down his life for his friends.” Strange has finally been able to let go of his arrogance and narcism, realizing that there are more important things that just himself. With all of the praise for the themes, one would assume that the rest of the movie is just as good, but it’s only partially the case. Sadly, the villain suffers the “Marvel Syndrome” which is, a villain that’s not all that interesting or dynamic. And unfortunately this also the case with our main protagonist. Doctor Strange is an arrogant jerk, very similar to Tony Stark and his turn in the movie, while thematically well done is not as impactful as it should be. In the end it seems to easy and the turn lacks any sense of depth that one would expect. The movie gets lost in the kaleidoscope visuals, forgetting that the real story is the characters, leaving the viewer feeling cheated. Doctor Strange feels less like it’s title would suggest and more like another formulaic Marvel origin story. Luckily Benedict Cumberbatch was cast and immediately has the charisma needed to carry the movie, without him, the lack of depth would be detrimental. All together, the cast is solid with Tilda Swinton, as The Ancient One, the true stand out, even though she does live beyond this film (which is a loss to the series). The music is good, Michael Giacchino has created one of the more memorable themes in the MCU. All together the movie is thematically wonderful yet suffers from rushed character development and more focus on empty CGI spectacle than heart. Doctor Strange is rate 3.5 out of 5 levitating capes. This entry was posted in Disney, Doctor Strange, Faith, Film, Marvel, MCU, Movie Review, Movies, Uncategorized and tagged Doctor Strange, Faith, Film, Marvel, MCU, Movie Review, Movies on November 4, 2016 by mrushing02. 2013 was a massive year for the Star Wars franchise as George Lucas sold Lucasfilm to Disney for four billion dollars. Yet the biggest surprise from the deal was the announcement of more Star Wars films in the Skywalker Saga, meaning the long rumored sequel trilogy would finally come to fruition. Since that time, fans have excitedly and trepidatiously awaited December 17th, 2015 for Episode VII. Anticipation built throughout the year as the movie’s coming was heralded by soup cans and action figures alike. The film’s release has seen a maelstrom of emotion from fans and critics as The Force Awakens has become the best reviewed Star Wars film since The Empire Strikes Back, but the question is, “Is it really that good?”. As I have gotten older, one of the joys has been the realization that the Star Wars saga is about more than just good and evil, it was George Lucas’ way of giving a history lesson about freedom. The Original Trilogy was about how freedom is won back from a dictatorship, the Prequel Trilogy was about how freedom is lost as bureaucracy and corruption undermine a democracy and now the Sequel Trilogy looks to be just as timely. It has been thirty years since the Return of the Jedi and the galaxy has seen the end of the Empire and the beginning of the New Republic. As the Republic has taken hold and a new generation has been brought up in relative peace, the idea of vigilance against evil has gone out of fashion. The Republic keeps it’s fleet close to home and the loss of the Jedi to Luke’s nephew’s turn to the dark side has left the galaxy vulnerable. It has given rise to the First Order, a regime even more fanatical and bent on completing the failed mission of Darth Vader and the Emperor, bringing “order” back to the universe. The New Republic, unwilling to acknowledge the threat of the First Order, secretly sponsors the creation of the Resistance, lead by Leia, while publicly denouncing them. Leia is a child of war, understanding the price of freedom and is willing to sacrifice again for it’s continuation. Unfortunately there is resistance to seeing the First Order as more than a phantom menace in the senate and the correlation could not be clearer to the situation we face in the real world with ISIS, which has challenged the entire western world yet certain world leaders refuse to acknowledge the full threat. Another correlating theme is that of recognizing evil and facing it. Maz Kanata, the thousand year old bartender says to Rey and Finn, “The only fight: against the dark side. Through the ages, I’ve seen evil take many forms. The Sith. The Empire. Today, it is the First Order. Their shadow is spreading across the galaxy. We must face them. Fight them. All of us.” She sees the First Order for what it is and calls it out, it is evil and it must be apposed. What a timely message. We live in a world that is unwilling to call out evil for what it is and confront it, but Maz is absolutely correct that it must be named and fought. In this way, The Force Awakens proudly upholds the tradition that George Lucas began in A New Hope. As wonderful as the themes are in the story, they are not all completely fleshed out in the film. To get the full picture one must dive into The Force Awakens novelization, Before the Awakening or the Visual Dictionary to get everything I mentioned above. Director J.J. Abrams has made a Star Wars film that is truly faster and more intense. It flies at a breakneck speed and barely slows down to let the character breathe. Unfortunately this leads to some scenes that would have fleshed out the political landscape as well as the motivations of the villains on the cutting room floor. Honestly, it seems like an over-reaction to the Prequel Trilogy and it’s frustrating since the politics here are a crucial story point and resonant theme for the times in which we live. It’s still the thing I have the biggest issue with in the movie. Star Wars has always referenced and mirrored itself as Lucas would use themes and motifs in both trilogies to create the saga’s tapestry. As this new trilogy beginnings it’s clear that the same thing is happening, yet it’s not as well done as before. Regrettably The Force Awakens is much more than a homage or layer of the tapestry, it is a remake of A New Hope. Plot points line up almost perfectly as you think about each film and exact beats from Star Wars are repeated in The Force Awakens. Frustratingly this means that there is absolutely nothing surprising in the new movie, if you have seen A New Hope then you will pick up on exactly where this story is going including the death of a major character as well as the use of yet, another super weapon. The movie is clearly more worried about appeasing fanboys than truly inspiring the next generation of fans. The true salvation for this film is the casting. Daisy Ridley as Rey, John Boyega as Finn, Oscar Isaac as Poe and Adam Driver as Kylo Ren are all phenomenal. They are the key to the success of this film as they immediately bring you into the story and it’s their performances that cover a multitude of cinema sins. By the end of the movie you will care about each of them and be so invested as to what will happen, you’ll be wishing Episode VIII was next month. Alongside the new characters there are old favorites that have returned, Harrison Ford, Carrie Fisher, Mark Hamill and Peter Mayhew are all back. Ford has not been this engaging on screen in years and it seems he is firmly invested in doing justice to Solo, especially in light of his character’s demise near the end of the film. Carrie Fisher brings an understated grace to Leia which is a relief to anyone that’s seen her on the talk show circuit and Hamill has little more than a cameo, whetting the appetite of fans to know exactly what happened to Luke Skywalker. Interestingly for me, it’s not the old characters or their stories that captivated me, it was the new. Sadly the meta knowledge of Ford’s desires for the Han character robbed me of the emotional impact it was suppose to have. The film’s adherence to the formula of A New Hope and The Phantom Menace where the old, wise character meets their end does the same since you can see his death coming for miles. There is also something that just does not seem earned in Han’s death, story wise it makes sense for the character of Han and Kylo, but it’s just lacking something for me personally. I find myself much more invested in the character of Rey and where she will go next. Daisy Ridley has cemented herself as a star with this performance which is good news for the rest of this trilogy. This has been the mantra of this movie since it’s inception. It’s a dig at the Prequel trilogy even though Abrams has praised the fact that without Lucas’ breaking every rule in his work on the Prequels, the new trilogy would not have been possible. Where this idea works best is in the character of BB-8. The result is astounding. I challenge anyone not to fall in love with this new droid and struggle to not name him their favorite as credits role. The way in which the onset effect and the sound effects work to create a fully realized character is incredible. Where it did not work as well is with some of the creature design. The Happabore that drinks next to Finn on Jakku looks like a character from a Disneyland ride and the luggabeast that Teedo rides, lumbers at the pace of a desert turtle, making it the most impractical mount ever. In both places CGI would have been more effective in my opinion and more “real”. With all of the incessant chatter about the practical effects, one of the best new characters in the film is CGI. Maz Kanata is an outstanding achievement in character design in the same way Gollum was in The Lord of the Rings. You truly feel like the character is on screen with Harrison Ford and it’ll leave you longing to know more about her history. Strangely the CGI work at the end of the film is not as sharp as one would expect. The X-Wing battle above Starkiller base seems like an afterthought and looks muddled. The editing lacks the Lucas clarity in the geography of the setting and it’s one of the clearest examples of the magic he brought to the films truly lacking. Another important piece that is missing from this new movie is the addition of exciting new ship designs. All the ships here are just variations on Star Destroyers, Tie Fighters and X-Wings and the new ships like Ren’s shuttle or the Resistance transport are either forgettable or just plain awful. Sadly, there are also no fun alien cameos in the movie. Abrams seems preoccupied with creating new alien designs, which is fun but the lack of anything familiar in this area is a regrettable lack of connective tissue to the rest of the saga. This is not the best Star Wars movie, that honor still belongs to The Empire Strikes Back, but it is a better one than I initially thought. It has some problems in the pacing, lack of clarity in the story and themes as well as a death that still leaves me numb. Furthermore, the movie lacks a score that is as strong as John Williams other work in the saga. There are a few nice cues and Rey’s Theme by far the strongest new musical motif, but you won’t find yourself humming anything as you did with the Imperial March, Duel of Fates or the Forrest Battle. Seeing the movie four times has helped me to overcome a lot of the problems I still see and the performances of the new cast have me sold on this new trilogy. I would recommend seeing the movie more than once, since the first time can be a little jarring with it’s fast-paced nature and important story points almost glossed over because of it. I’d give the movie 3.75 lost lightsabers out of 5. Be sure to check out The 602 Club’s episode on the film, you won’t want to miss it! This entry was posted in Disney, Film, Movie Review, Movies, Star Wars, The 602 Club, The Force Awakens, Uncategorized and tagged Disney, Film, JJ Abrams, Journey to Star Wars The Force Awakens, Movie Review, Movies, Star Wars, The Force Awakens on December 26, 2015 by mrushing02. There are times when a movie comes along and grabs you right away, and in less than five minutes you find moisture welling up at the side of your eyes. Pixar seems to understand this effect well. They did it with the movie Up and have found a way to improve upon it with their latest masterpiece, Inside Out. The film follows Riley Anderson and her emotions, Joy, Sadness, Anger, Fear and Disgust as the Anderson family relocates from Minnesota to San Francisco. As Riley tries to acclimate to her new surroundings, her emotions try to keep up with the new experiences as well as the general task of growing up. What follows is one of the best and most poignant films ever made about growing up. One of the most surprising themes of the movie is how sadness, disappointment and bad things actually have their place in our lives. Riley’s emotions are lead by their fearless leader Joy, who is the true operator in this young girl’s life. Oh Fear, Anger and Disgust have their place, but it is Joy that they all look to. Joy is so much at the forefront that Sadness often feels left out, unimportant and seen as a nuisance to the other emotions. It is here that the themes blossom. So much of our lives are driven by the desire to avoid sadness and experience nothing but happiness and joy. We don’t see the use of sadness, disappointment or heartbreak, doing all we can to minimize them. This is played to perfection in the movie as Joy constantly tries to do exactly that, basically putting Sadness in the corner to keep her from messing everything up. Inside Out powerfully and emotionally helps illuminate for everyone the ways in which the worst things in our lives can actually become the best, sadness and joy going hand in hand. It’s here that complex emotions are born; things are never simple but a jumble of joy, sadness, anger, fear and disgust. Pixar continues to create brilliant original movies. Inside Out may be their best work because it’s not only good for children but adults and everyone in between. It’s a movie that will have you tearing up the whole time as you remember those moments that defined your life and changed the way you viewed the world. With themes that resonate like this, let’s hope that Pixar continues to pursue original works. Go see this film, it’s a five out of five emotions. This entry was posted in Disney, Faith, Family, Film, Movie Review, Movies, pixar and tagged Christianity, Disney, emotions, Faith, Family, Film, Inside Out, Movie Review, Movies, Pixar on June 22, 2015 by mrushing02. Imagine a world where all the artists, dreamers, scientists and forward thinkers joined leagues and created with reckless abandon. They made the most incredible things, away from the status quo, away from politics and bureaucracy, nothing to hold them back. This is Tomorrowland. Now that you’re imagining this most incredible place, imagine they invent the ability to see the future, our future, and that it ends much sooner than we think. This is Tomorrowland, this is Brad Bird’s new film that challenges where we are and where we could be if we are willing to make a change. There is something wrong with society. We see it all around us. We might have the coolest tech around our wrists,but we’re also saddled with major issues like obesity and starvation. NASA installations are dismantled as the present is our only concern. It’s as if we are waiting on the world to change, yet are unwilling to lift a finger to make it happen. Tomorrowland brilliantly shows us the problems that arise when good people just wait on the sideline and illustrates what could happen if we were willing to sacrifice now, for something better in the future. The film is not subtle with this point and nor should it be. All around us the greatest tech we’ve ever created is in the pockets of everyone, but what does it really benefit the future? How does having a smart phone truly change or inspire the world to improve? Instead, we’ve only become consumed with consumption. We want now, the immediate pleasure of owning the latest gadget, without any thought to if this is the best use of our resources or to whether these devices actually make the world a better place for their existence. Why we create and what we create looms as a massive question and a major responsibility — not necessarily one being asked or respected. Tomorrowland challenges us, as Interstellar did last year, to think about the future. Is the lack of exploration of our solar system really the best idea? Are smart phones and watches really the smartest uses of our energies? Or might we think of better ways to build cities, roads, grow crops and plan for a future that extends more hope for more people? It is possible with time, patience, creativity and sacrifice. Unfortunately sacrifice is not really a term our modern society embraces. There does seem to be a loss of perspective; thoughts of tomorrow have been replaced with an obsession over what can be accumulated or acquired for immediate pleasure. A mandate was given at the beginning of time to take care of the earth and steward it. We were meant to create and foster life all around us. Inspiration used tocome from places like NASA, where the impossible seemed possible. Where the undiscovered country of the future was just a shuttle ride away. Technology was about making the world a better place, not just a more convenient one. Tomorrowland reminds us that we are all in this together, and not just now, but for the generations to come. One of the biggest themes of the film is that of hope and its importance to creativity and planning for the future. Without hope it is easy to become myopic, fixated on the present and trying to survive. Ideas need to be challenged. New blood needs to be introduced so intelligent people are roused out of the malaise of their genius to see something in a whole new way. Casey is able to do that for Frank in the movie. She is able to help him have hope again and evaluate problems from different angles and in doing so, change the future. It brings to mind the wonderful quote from Galadreil in The Fellowship of the Ring, “Even the smallest person can change the course of the future.” Casey is that person in Tomorrowland. She’s full of life and the idealism that leads her to strive for understanding which then enables her to make an impact on the world. Fostering hope is a big task. Getting to a place where the here and now are not the only things that people care about calls for a massive reordering of priorities. We can have a positive impact but only if selfishness and greed cease to be the motivations that drive what we do. Ultimately, such a shift requires a change in the core of our being. Brad Bird really delivers with Tomorrowland. He’s created something magical with the power to remind us of our calling to live not just for now but for the future. 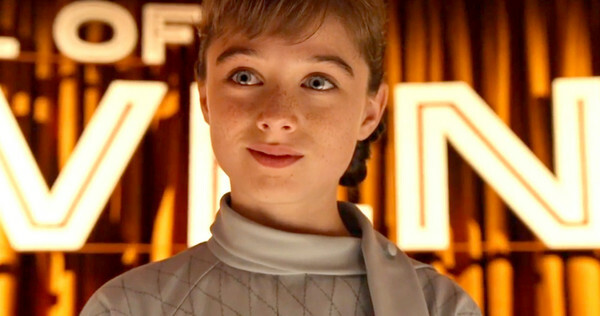 George Clooney may be the big name here but it will be Raffey Cassidy that will steal your heart. It’s nice to see an original movie, not in a franchise, be good. Movies like this need the support if we are to get more original films. Go see it and revel in the joy of imagination and hope for the future. Tomorrowland is rate 4 out 5 jetpacks. This entry was posted in Disney, Family, Film, Movie Review, Movies and tagged Brad Bird, Disney, Films, George Clooney, Movie, Movie Review, NASA, Tomorrowland on May 24, 2015 by mrushing02. In 2002 Disney decided to make a film based on one of it’s theme park rides. The Country Bears was a box office flop, yet this did not deter the studio from continuing to mining it’s rides for inspiration. The very next year, Pirates of the Caribbean: Curse of the Black Pearl would become a monster hit, going on to inspire 3 more films with a 5th one currently in the works. This entry was posted in Disney, Film, Movie Review, Movies, Podcasts, Trek.fm and tagged Disney, Educating Geeks, Film, Movie Review, Movies, Pirates of the Caribbean, Podcasts, Trek.fm on April 11, 2015 by mrushing02.